Leviton Black & White® 2-Pole 3-Wire industrial grade flanged outlet locking receptacle has a voltage rating of 250-Volts AC and current rating of 15-Amps. This screw-mountable receptacle accommodates conductor of size 18-10-AWG. 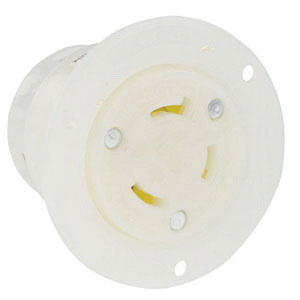 The back connecting receptacle in white color, has nylon face and body for better protection and durability. The flanged outlet locking receptacle meets UL 498, File E13399, UL Federal Specification WC-596: File E13399, CSA C22.2 No. 42: File LR-406, ANSI C-73, NOM 057 and NEMA WD-6 standards.